Big sell off today - the SPX lost more than 2 %. The SPX broke out of the wedge in the morning, retested the broken wedge support line a bit later and then sold off down into the 1310ish support area. Today's sell off is very similar to the one on Jan 28th, so, it'll be very interesting to see how far we bounce from here. If today was only a correction then we should see new highs within just a few days. If this sell off is real though wait for a convincing break of 1310ish and 1300ish. May be you remember that I wrote that the US Dollar usually bottoms three weeks before the SPX tops. 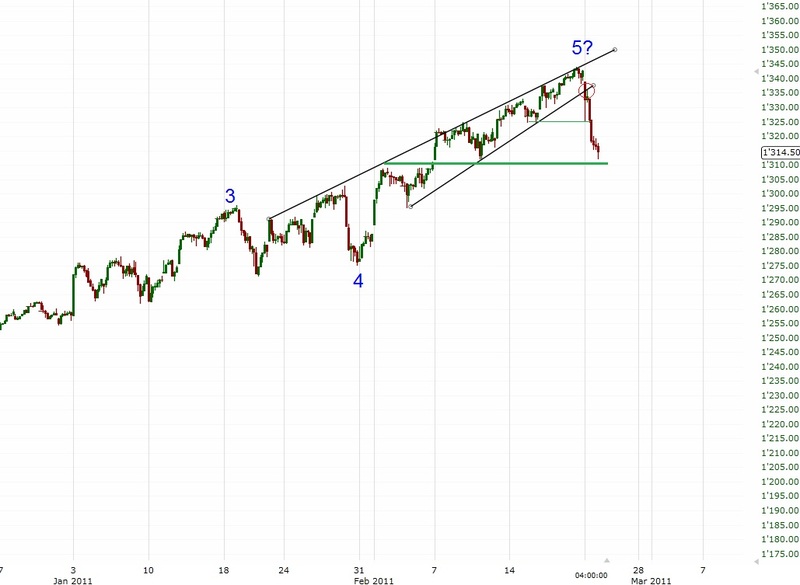 Well, the US Dollar bottomed on Feb 1st and the SPX topped on Feb 18th, thus this pattern looks pretty good so far.